Chennai Petroleum Corporation Limited (CPCL), as a measure of Skill Building Initiative for the Nation, invites applications for engagement as Trade Apprentices under Apprentices Act, 1961 / 1973 (as amended from time to time) in the designated / optional trades mentioned below. We try to explain complete detail below in this article related to this CPCL Recruitment 2018. We took this information from the PDF file which was shared by CPCL department on their official website. Read the whole article carefully before applying. Note: One position each in Fitter & Electrician trade are reserved for PwBD – OH (Partially Lower Limb damaged), Two positions in Back Office Assistant are reserved for PwBD – VH (Blind / Low Vision), One position each in Executive (Human Resource) & Executive (Computer Science) are reserved for PwBD – HH. Page 2 of 6 ABBREVIATIONS USED: PwBD = Persons with Benchmark Disabilities, OH = Orthopedically Handicapped, HH = Hearing Handicapped, VH = Visually Handicapped. What are the various Eligibility Criteria for applying this CPCL Recruitment 2018? Education: Various Education qualification is required for various job profiles. 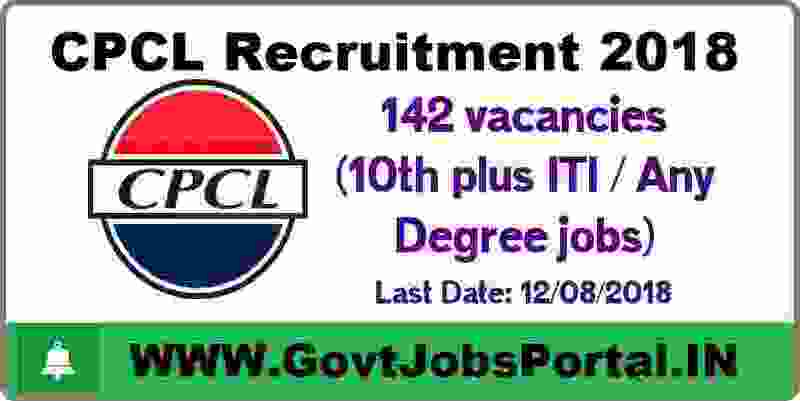 Those who have the following educational qualification: “ 10th Pass+ ITI , Graduates, MBA, MCA” can apply for this CPCL Recruitment 2018. Age Bond: Those who are wishing to apply these Government jobs in India must have age in between 18 years to 24 years. What is the Mode of Selection for this CPCL Recruitment 2018? 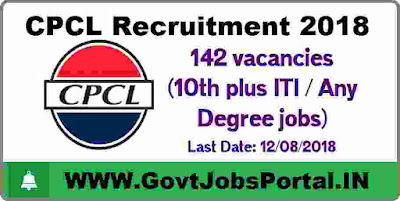 What is the process for applying this CPCL Recruitment ? The contenders will have to apply online for these vacant posts of Apprenticeship Trainee. You have to follow the online website of Chennai Petroleum Corporation Limited for online application form. The official website link is “www.cpcl.co.in”. The aspirant must own a valid e-mail ID. The website will be functional for applying online from 30th July 2018 to midnight of 12th Aug. 2018. When the candidates fill up the application form and submit their form online, system will show a Registration Number and generate a Registration Slip. You have to download that registration slip and keep it safe with them for future reference and appearing for the verification of their records. 30TH July 2018 is the Starting Date to apply. 12th Aug. 2018 is the Last Date for applying. Disclaimer: We took this information from the following website: “www.cpcl.co.in”.